When a company does decide to take on a major change, they must find ways to simplify and promote the full participation from all members/ employees, starting from day one, which helps us to reduce the risk of losing both the financial investment and the spirit and self-confidence of our employees. ERP is a centralized approach to business processes, and that is beneficial. Implementation of the ERP system is not only full of technical challenges, but other problems need to be addressed by any organization. Generally, employees do not like change. For employees, the change can be scary as they might think that their daily job roles will be affected. 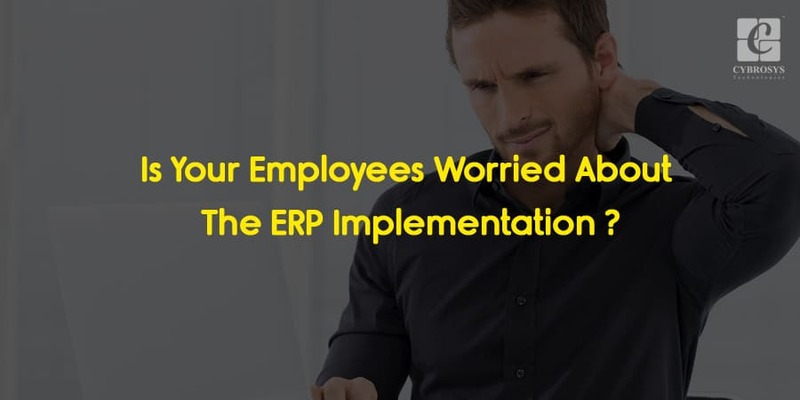 Sometimes the changes in the ERP system will make our employees panic and also they may not accept these sudden changes, and hence, enough countermeasures should be taken by the organization, to keep everything perfect and flowing. The company should follow some proper steps to make sure that everything works out as planned and expected. Once they understand that ERP is a strong backbone of the enterprise, they will start accepting the new change. The company should also explain to them how the change could affect them in a positive way to make the process more efficient. This will guarantee employee's growth and job security. An ERP change can be a challenging task that requires successful management of many moving parts. But with proper training, stakeholder support, and a clear-cut message, it can be a fruitful endeavor that helps a company to a better, more streamlined, and more productive manner of operation. The primary step that any organization should take is to teach the staffs the need for ERP implementation. Stakeholders have the key role in creating an environment of acceptability and excitement about the new ERP implementation. Keep important members of the company involved in creating accountability and establishing routine meetings to review project progress and discuss any roadblocks. Some of the staffs are important to everyone and they have more influencing power; Almost everyone listens to them. Keeping the organization's major team lead engaged will create a positive environment for the employees. To make the staffs more comfortable with the new change, train them. A system is only as good as its use, and training employees on the proper way to interact with the new ERP system are vital to ensuring that it is used effectively after implementation. Train employees early on, and allow them the necessary time to adjust to the new processes and functions. Training can completely change their view on ERP implementation, as it will equip them with skills to handle the new system efficiently. To make sure that training is done right, a feedback loop should be created. Make sure there is an avenue to collect feedback and take any necessary action on such feedback. The feedback loop will ensure active participation. Keep in mind, simply offering a venue for feedback is not enough. The employees can also provide some insight on how the ERP implementation can be improved and other aspects that can further improve the whole ERP implementation process. Make sure that feedback is satisfactorily addressed. Allocate time to review this feedback and decide upon any actions to be taken. Keeping a log of submissions and the response to each can help the organization sustain accountability and make sure all voices are heard and respected. Odoo is a package of all management software, which is perfectly fit for all types of companies and businesses. Simply, Odoo is a combo of all possible features and Apps you will need to run your business effectively . 2 Million users are running their business with ODOO and around 5000 inbuilt modules are ready to use. It is also easy for an organization to do Odoo implementation and Odoo integration from Cybrosys Technologies who specialize in providing Odoo related services. > Is training done correctly and adequately? Employee training programs should be carefully organized to make sure that the roles they play are covered and they are comfortable with their responsibilities under a new ERP system. Employees come with a different skill set and learning capacity, and that's why it is the responsibility of the management to check for unfinished training and retrain staffs if needed. They should also monitor the quality of training session and take feedback from the employees. > Is everyone still excited about the change? It is tough to measure employees involvement, but it is necessary to assess the current environment. Keep an eye out for this and continuously support leaders for motivating the employees as necessary. > Is everyone involved in the project working according to his or her accountability? Is feedback still being collected and reviewed? Are roadblocks being quickly identified and resolved? Check continuously to guarantee that duties are being fulfilled. If someone fails to deliver, make the necessary advice or training make them efficient. > Does everyone understand the impact of ERP on day-to-day operations? It is easy to get lost in the glory of the change and not understand its impact on day to day operations. The management should take proper actions to ensure that everyone understands the impact of ERP.